Launched in 2013, Fly Casino is the latest online venture from Peak Interactive, a company that started out in 1997 with Omni Casino . In the decade and a half since launching, Peak Interactive has won countless awards and is one of the leading providers of online gaming. 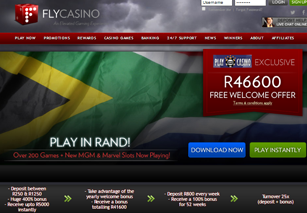 A first glance at Fly Casino suggests they are onto another winner as it soon was recognised as one of the best South African online casinos accepting Rand!. It uses the latest digital encryptions to ensure complete member confidence, has 24/7 customer support, comes with a vast selection of games, plus offers great bonuses and promotions. The casino operates in South African rand, sterling, US dollars, Australian dollars, euros, yen, and Canadian dollars. Fly Casino uses Playtech software. Playtech is one of the online gaming industry leaders and are known for producing some of the best games on the market, particularly their Marvel slots. The Marvel range features top-of-the-range graphics and sound, animations and movie scenes, along with excellent game play. Fly Casino has more than 160 games for you to choose from so there's something for everyone. The games are split up into seven categories to make picking a little easier: video poker, slots, table games, card games, keno & arcade games, Marvel slots, and scratch cards. There is also a huge variety of games within those subcategories. For example there are eight different types of Blackjack, nine variations of Roulette and an impressive 15 different types of video poker. The variety of slots is also impressive with Fly Casino featuring video and classic slots with winning lines ranging from one in games like Safecracker all the way up to the quite frankly ridiculous 243 contained in Archer! Members can test out all the games for free as well as for money. In addition, Fly Casino will continue to offer you other promotions such as the Hotseat or the Fly Away Sunday bonus to help you get more bang for your buck. There's also a four-tier member programme called Fly VIP Rewards which members are entered into automatically. Your earn points every time you play and the more points you accrue, the bigger the rewards.